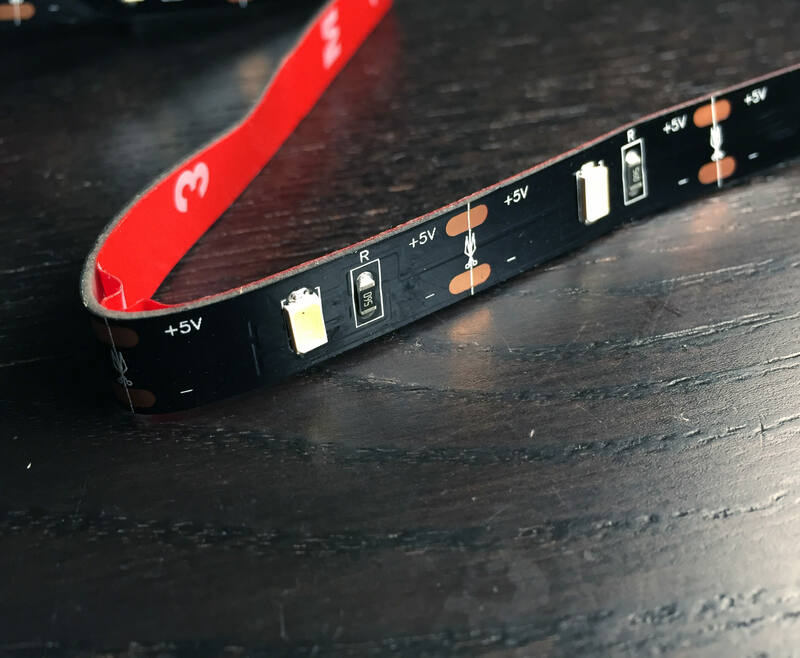 There isn’t a suitable forum for LED strips so here it goes. 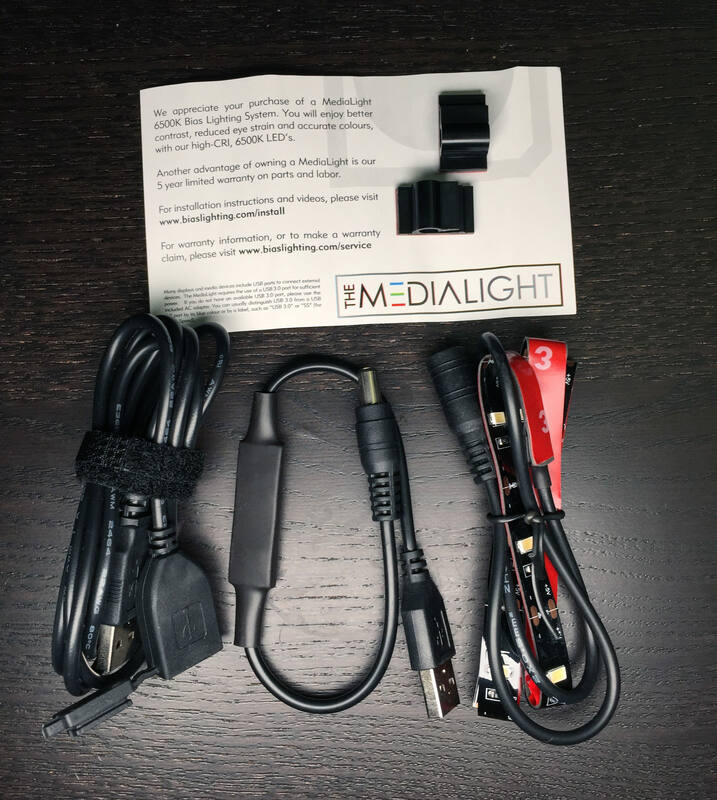 I got a sample of the Medialight Pro 6500K CRI99 LED light strip for bias lighting monitors and televisions. 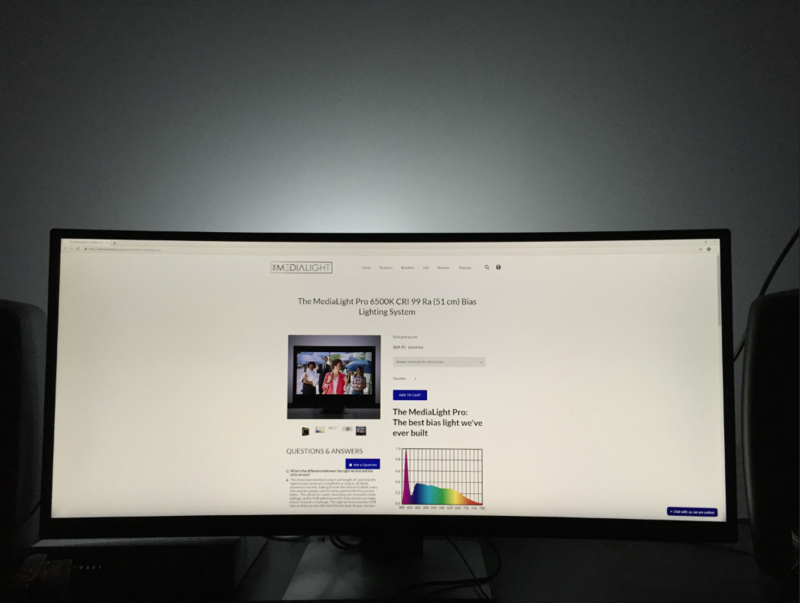 This is a feature that decreases eye strain in a completely dark room so that the (relatively) small viewable display area is not the only bright thing in your field of view. To my knowledge Philips is the only TV manufacturer with a built-in bias lighting system (Ambilight). Aftermarket kits are available and they can even be programmed to dynamically react to the content on screen when you wire the HDMI signal through the bias light controller. 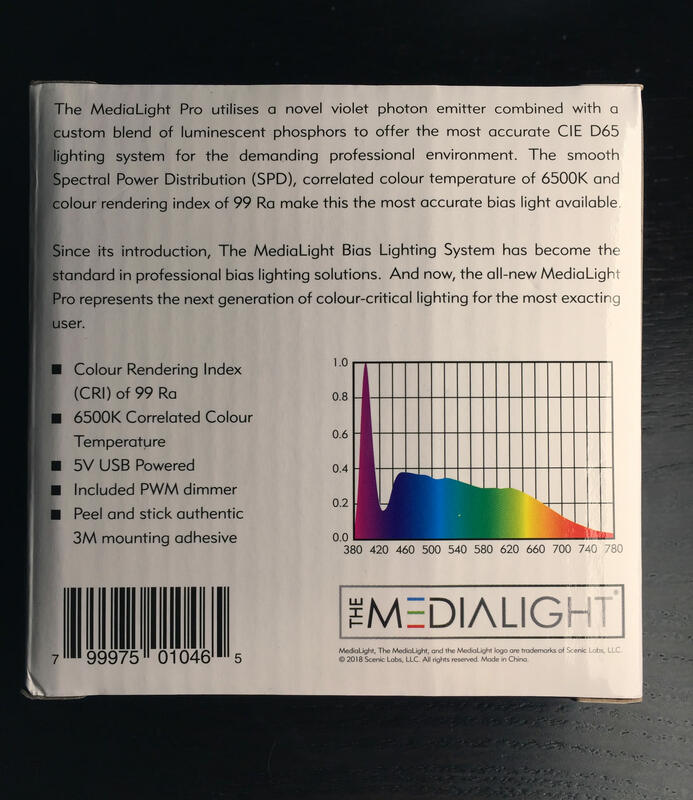 The Medialight Pro is a single color bias light with PWM dimming. I don’t know the manufacturer of the violet (~400nm) pumped LEDs. Despite the similar package size they are not Yuji VTC series, that’s for sure. Contrary to what it might look like here, all the LEDs are identical in color temp. Image adjusted to be closer to what it actually looks like. 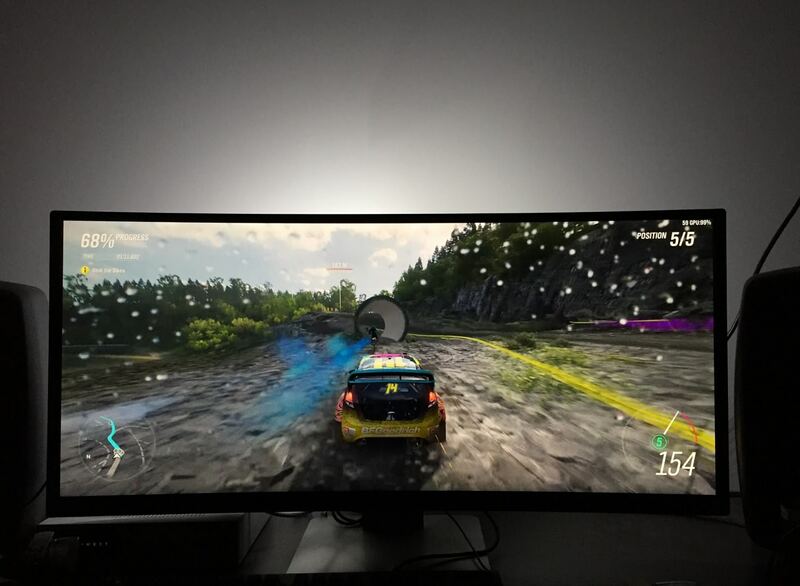 My monitor is actually calibrated to 6150K, not D65. 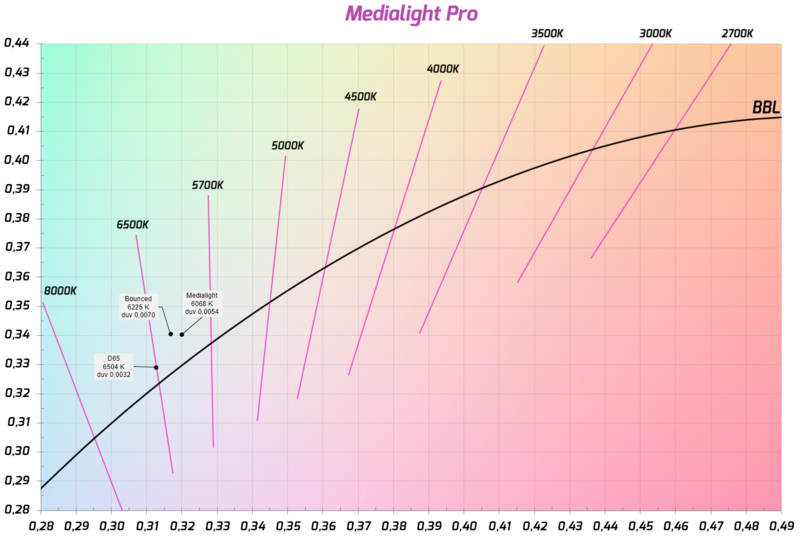 The violet pumped LEDs produce a stunning spectrum with super high CRI as promised. Bouncing it off of my Grandview projection screen gives the light a bit of greenish tint, which would be visible compared to a D65 calibrated monitor. XY coordinates on CIE1936 chart compared to the D65 illuminant. The greenish tint would benefit from a slight magenta tint to the wall the light is bounced from. Very interesting. I would love to see more of these. If these were 3000k and below BBL, I would buy a set right away. Better would be the use of multiple CCT emitters with the ability to adjust to match your screen/monitor. Since monitors can be adjusted to different CCT by the user, it would be great if these could be as well. Wow, that’s quite a UV spike these things emit..
Well, it’s around ~400nm so not bad, really. Probably makes things more interesting to look at, really. Here’s the spectrum compared with and without polycarbonate saftely glasses to block actual UV. Doesn’t affect CRI. The peak is huge compared to the Yuji VTC D50 or sunlight. I have a 400NM light for curing glue, and it’s not pleasant when you look at the output. Sure the relative peak is higher but the energy is not. Just tested and even a dim sunlight through a thick cloud cover in the morning has more absolute 400nm content than this when bounced from a wall and observed from 40cm which is not realistic. Of course you shouldn’t look straight into the LEDs without filtering. My point is that relative values are more important because your iris accommodates to the full spectrum. A bias light is supposed to be about 10% of the maximum brightness of the television. In most situation the visible light from the display will trump the output of the bias light. Yes, in the application for which it is intended, you’re right. I was thinking about when you use it for work light or whatever else we can come up with. In such case i would prefer to use a UV filter. I wonder if these LEDs also light up fluorescent objects (white paper, yellow objects etcetera) considerably more than low / no UV LEDs. Found this review on a google alert. 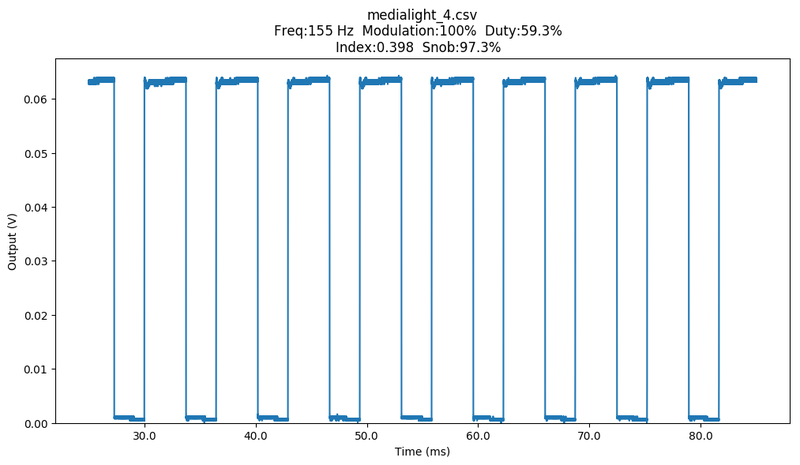 The measurement for the dimmer should have been ~210Hz. Most people should not be able to detect any flicker at this frequency. There are higher frequency dimmers for higher voltage strips, but for somebody who is sensitive, which is exceedingly rare, I usually recommend that they cut to achieve the appropriate brightness. Depending on the meter, you can get a slightly different CCT or CRI/TCLI but your results are very close to our labs tests. Thanks for posting! Maybe it varies batch by batch but mine operates at 155 hertz. Flicker detection is subjective, but at anything under several kilohertz there is a risk of someone not liking it. 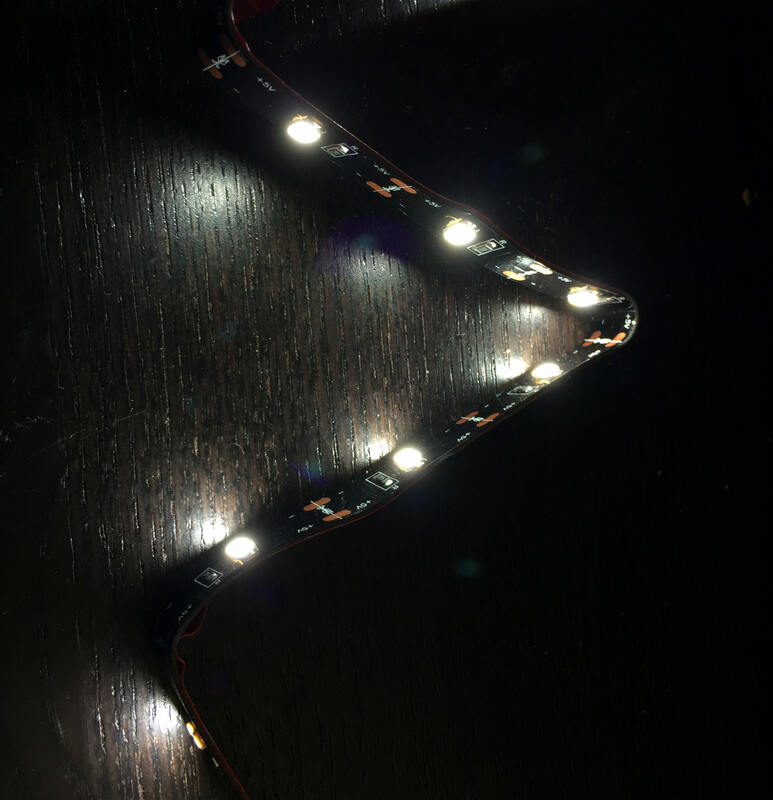 The snob index of 97% means that it is likely to be noticed, but less likely when positioned as intended so there’s no direct line of sight to the LEDs. - Why a bias lighting has to use ultra high CRI like this? AFAIK the purpose is just to make our eyes adapts better between the bright screen to the dark surrounding. Unless it’s bright enough to be useful as a room ambient lighting then ultra high CRI will be very useful. Is it bright enough for room ambient lighting when not in use as a bias lighting? - Those polycarbonate test is very useful if we want to use the growing popular violet/purple pumped LEDs. Especially those used in the museums. You don’t want to faint a Monalisa painting with UV/violet/purple/etc… LEDs. While a bias light reduces eye strain, it also has a subtractive effect on the color on the screen. So, you do want the highest CRI possible. Older professional bias lights for CRT were tungsten. They had very high CRI, but generated a ton of heat and couldn’t fit behind many modern displays. The fluorescents that came afterward were not a great replacement. Generally speaking, poor SPD and lower CRI is harsher on the eyes. Many colorists aren’t working 8 hour days, but rather 12-16 hour days. The lower CRI/spiky SPD (in the perceptual range) light is found to be fatiguing, even comparing relatively high CRI fluorescent to high CRI LED. I see what you are saying about a harsh curing light, but that’s an ultraviolet emitter, not being used to drive a blend of phosphors and also designed to be intense enough to cure a composite material. 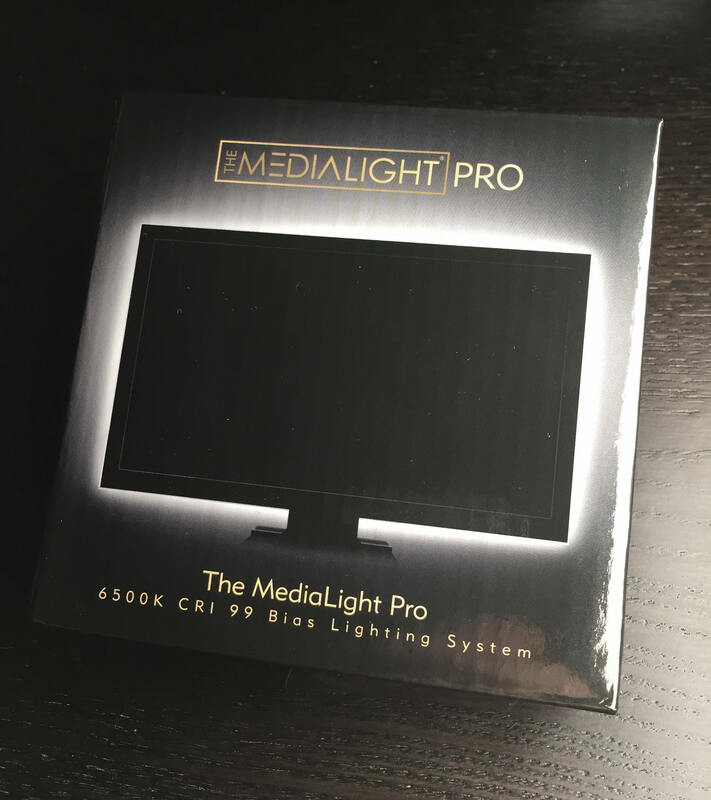 The lights in the MediaLight Pro are used to provide a dim surround reflected off of a neutral gray backdrop. SMPTE says the maximum brightness should be 4.5 nits. 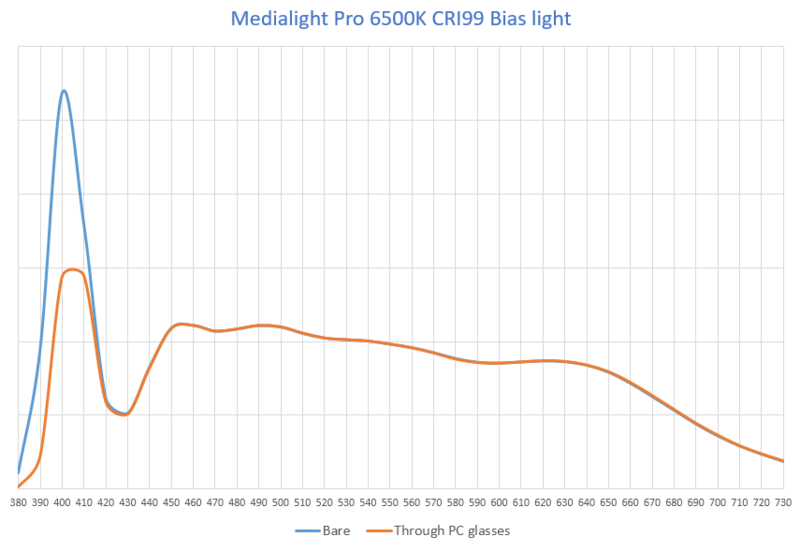 Imaging Science Foundation says it should be in the 10%-20% of the maximum brightness of the display, even for HDR, all of the light reflected off of a matte gray surface. We also tested chips from a number of manufacturers, and also with different SPDs. It is possible to more closely mimic D65 without the spike, or to see a less pronounced one, if you take a hit in CRI/TLCI. 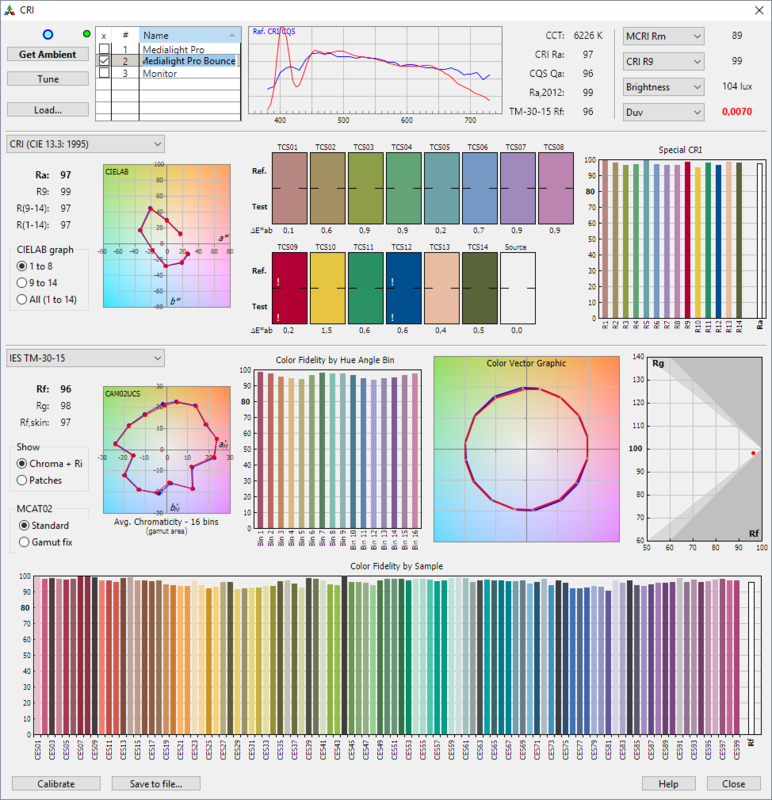 The feedback from our testers in the colorist community indicated a preference for higher CRI, even though there was not a perceptual difference when tested side by side with the lower TLCI D65-mimicking chips. You aren’t going to get a suntan from this light and driving around town for 5 minutes on a cloudy day will subject you to more UV rays than many work hours in front of a display. Having windows in your house is going to subject you to thousands of times more near violet and ultraviolet radiation. It’s really a niche product at this point. Our 95 Ra blue-emitter lights are what we recommend to 99% of our customers. However, if we stand still, we aren’t serving our customers well, so we are always trying to incorporate novel chips. @Medialoght, clémence was not speaking about UV human exposure. +1 to this. I was going to reply him about this. Yes, I’m not afraid of UV. We, tropical dwellers exposed to UV far more than most people in the other side of the world. Museum grade glass has full UV protection. Museums use UV+AR coated glass and/or acrylic over their most valuable artworks. The UV emission of the lights wont’ matter for pieces covered by UV coated glass. But yes, a lot of paintings don’t have anything over them as well.